I thought a lot about how I would photograph her. But after dreaming about some grand and sizable production ideas, I decided not to try to do too much. I would just do what I do best, and keep it simple. We were scheduled to shoot in a private meeting room in a downtown Seattle hotel, with no chance of moving to a different location. Because of her full schedule that day, I knew she would be tired. An interview with Steve Scher on NPR (listen here) right before the shoot, and speaking at Benaroya Hall for ‘Seattle Arts & Lectures‘ right after. I had a small window of time to work with her. When Annie came into the room, she looked around at the lighting setup, and said, “Wow, this looks scary.” My thoughts exactly, but it wasn’t the lights I was thinking about. We talked a few minutes about photography and cameras before she sat down. Then I told her about my idea for the portrait, and asked if she would mind taking off her glasses. She said that was fine, and I started to shoot. It was a balancing act trying to find the line between being in control to get what I wanted, and not being pushy. I could tell that she was not comfortable being photographed. She moved around a lot while I shot, and I decided to be flexible rather than push too much to hold a certain pose. Things don’t always go exactly to plan, and sometimes this can be a pleasant surprise. It felt like the shoot ended up being a collaboration in making the pictures. It’s not often that I work with someone who is so willing to be expressive and experiment as she was. Shortly after we started, the shoot came to an end, and I knew that I had the shot. I thanked her for her time, and she said, “You did good.” I’ll take it! What a compliment. The article that was published in Seattle Metropolitan, and written by Steve Wieking can be read here. 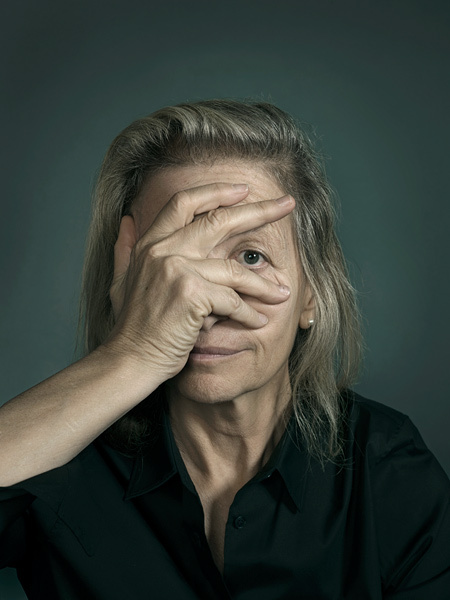 *Update* – My portrait of Annie Leibovitz was selected in the American Photography 25 Competition (AP25) and will be published in November 2009. This is a huge honor for me! The link will take you to a post with more about the award. Very nice, John. A once-in-a-lifetime thing for sure, and it looks like you nailed it! Great shot and story. Thanks for sharing. Nice work. I think the portrait is very interesting, you captured a person who looks through a camera with the same eye for a living brilliant. I compliment you on the simple way that you photographed her. I think that if you were to go to overboard then it really would not be here. You say that she wasn't comfortable being in front of the camera but in the photograph she just as comfortable in front as behind. I'm glad that you worked with the way that she was moving about and kept fidgeting I think that if you were to just photograph her from head straight it would look like it was a school photo and not a proper one. Very Brilliantly done. Wow! What a daunting experience! Seems as if you were given a challenge and you definitely made the best of it! Love the way she is portrayed here, absolutely fabulous! What an amazing experience to photograph Annie. I feel lucky just to have had the opportunity to assist for someone that assisted for her. I probably asked too many questions about her. Oh man, what a stunner. You both did an excellent job here. Thanks a lot for sharing it! Very cool photograph, reminds me very much of Dan Winters style.